November has brought us some amazing weather! Five hikers took advantage of the warm, still day to hike Old Rag including Kelly O'Rourke, Dave Borszich, Iva Gillet, Bill Holman, and Marit Anderson (leader). Unfortunately Lynn Dawson and Grace Nui could not meet as planned. 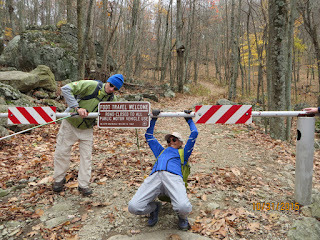 Midweek hiking allowed us to have the trail almost to ourselves as we ascended via the Ridge Trail. We loved all the rock scrambles and squeezes, overlooks, and soaring buzzards and hawks. Bill met us at the summit and we enjoyed our lunch and apple cake together. In the distance we admired Stoney Man and Robertson Mountain. 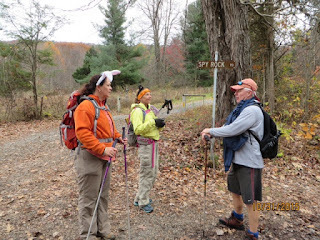 We crossed on the Saddle Trail and split at the intersection of Weakley Hollow Fire Road (Kelly, Dave, Marit) and Berry Hollow Fire Road (Bill and Iva as they headed north to the PATC banquet in Vienna). 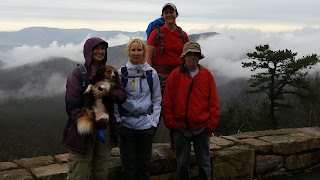 The group covered 9.59 miles and 2,464 ft of ascent. The return along Brokenback Run was especially nice as the stream bed was quite full. Old Rag is still one of our favourites, so we were happy to climb it before winter sets in. 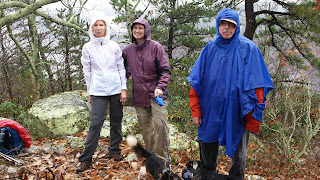 Well, we are not afraid of a little rain here at this hiking club!! 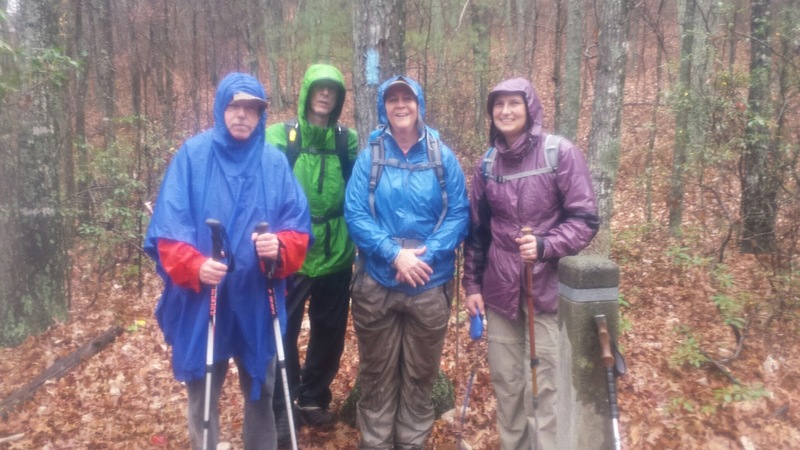 No sir, even though it was raining, hike leader Kelly O’Rourke was joined by Michael Seth, Iva Gillet, Bill Holman, Lisa Lampe and Maxwell to hike almost 7 miles with close to 2,000 ft. of elevation gain. It rained all the way to lunch time, then cleared up and we were finally able to see the beautiful views of the valley and surrounding mountains. Due to the wetness, we decided not to do the entire loop, but all got chocolate and a rain check to try this beautiful hike another time. It was a terrific day for working in Shenandoah National Park. A small but hard working group of four including Andy Willgruber, Hunter and Meghan Cloud joined hike leader Lindsay Brown for a few hours of looping shear work along the Appalachian Trail south of Rip Rap. 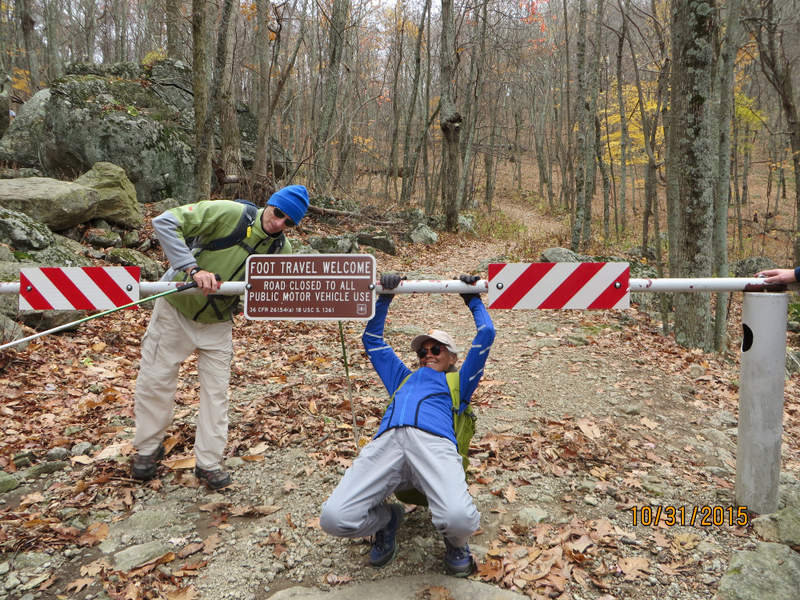 We saw many hikers on the trail who all seemed to appreciate our work. The Park was packed on Saturday as many people were out checking on the autumn leaves. Hunter and Meghan had to leave around lunch time but Andy and Lindsay had a nice lunch along the trailhead and took time to review the instructions for our Trail Inventory Report. Halloween is a great day to climb Spy Rock, so 13 hikers did just that meeting hike leader, Marit Anderson, either at Albemarle High School or the trail head at Montebello Fish Hatchery. The clan included Grace Nui, Tom & Ellen Shields, Todd Patrick, Claire Cline, James McAdams, Jeanne Densmore & Dan Ralston, Emerald Young, Caitlin Henning, Rich Bard, Iva Gillet, and Bill Holman. A cool, but clear day, the group climbed the short, but steep out and back trail which measured in at 4.1 miles and 1,263 ft. of ascent. The drive in along Crabtree Creek was full and impressive, and water indeed was along our route at Mill Creek and Louisa Spring Branch. Most of the leaves had fallen, but the view of the top was still beautiful, and a way to capture the autumn colors still remaining. Fortunately it was not too crowded when we reached the summit, so we got to enjoy our lunch, chocolate, and pumpkin chocolate chippers in a relaxing way. Many photos were taken and sunshine made for many smiles. Congrats to the newlyweds - Jeanne and Dan! Iva and Rich - he just had a birthday! After lunch Dan, Jeanne, Tom, and Ellen hiked more miles towards Maintop Mountain and the rest of the group descended down to the parking area with a jaunt to look at the fish at the Montebello State Fish Hatchery. There were some big trout in those tanks! A number of hikers went on to Devils Backbone Brewery and the rest car pooled to various locations. The rest of the night was for trick or treating and other spooky antics. Who is that bunny at Montebello Fish Hatchery?